Both original Adios and Adios Max are probably the most popular diet pills in the UK. Because of their low price and the fact that they can be found in most high street stores and large supermarkets, Adios have become a best-selling brand. Dieters are interested in watching the fierce competition between Adios and Lipobind as to which is the number one diet pill in the UK! Adios Max is a non-prescription, herbal-based slimming pill which belongs to the fat-burner category. How Different Is Adios Max? Just like the original Adios, Adios Max contains the same ingredients. The only difference is the higher concentration of Fucus Dry Extract which is 120mg in Adios Max compared to the 45mg in the original Adios. Fucus Dry Extract is the main slimming ingredient in both Adios versions. This extract comes from a kind of seaweed and contains a large amount of iodine. Iodine can stimulate the thyroid gland to produce more thyroxin which is a hormone that can increase the metabolic rate of the body. Adios Max, just as Adios original, works as a fat burner but without any spectacular results. If you need to shed just a few pounds and you don’t want to spend a fortune on diet products, Adios Max could be a good diet pill for you. But if you need to lose more weight you will probably have to look for something more effective. Can Adios Cause Side Effects? There are no reports of side effects concerning Adios Max, but it would be advisable to consult with your doctor if you are suffering from any thyroid gland problems because the product contains iodine which is used in thyroid gland treatments. Also, avoid Adios Max if you are pregnant or breastfeeding. Adios Original or Adios Max? Adios Max is not much more different than Adios original. The only difference is that Adios original contains 45mg of Fucus Dry Extract, its active ingredient, while Adios Max contains 120mg. However, we do not think that increasing the Fucus concentration increases the efficacy of the product much. Where Can I Buy Adios Max? 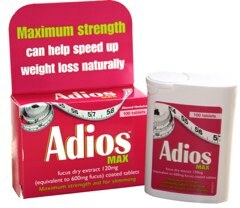 Adios Max is practically sold everywhere as it is one of the most popular slimming pills in the UK. You can buy it in almost all pharmacies like Boots and Superdrug, high street supermarkets such as Asda, Sainsbury’s and Morrison’s and in health and beauty stores all over the country. Do You Recommend Adios Max? Adios Max is not a clinically tested and proven diet pill, but its popularity and the large number of users have proved that the product does not cause unwanted adverse reactions. 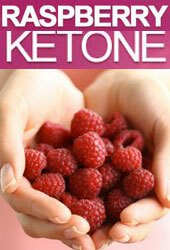 However, Adios is not the most powerful fat burner and its slimming efficacy seems to be rather limited. We can recommend Adios to dieters who are on a strict budget and who want to lose only a few pounds. There are several other brands that are clinically proven and have an outstanding track record of success. 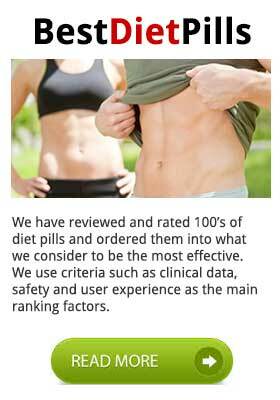 We have compiled a list of the most effective non prescription diet pills available without restriction.